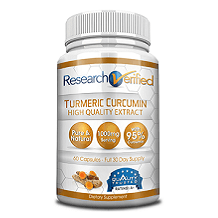 Research Verified Turmeric Curcumin Review - Does It Really Work? This product review focuses on Research Verified Turmeric Curcumin. Based on the information gathered during this review, Turmeric Curcumin is one of the top-rated and high-quality products. The major ingredient turmeric (Curcuma longa) is standardized to contain 95% curcuminoids and has antioxidant capabilities. It also has antidepressant and anti-inflammatory qualities. It claims to relieve pain and improve digestive health. You will learn more about this product as you read the rest of this review. Turmeric Curcumin contains turmeric (Curcuma longa) standardized to contain 95% curcuminoids. It is 100% pure and has no added ingredients, fillers, or binders. Natural turmeric is known for its antioxidant, anti-inflammatory, and anti-depressant properties among other benefits. The suggested dosage is one or two veggie capsules twice every day. The capsules should be taken thirty minutes before meals with eight ounces of water. Each capsule of Turmeric Curcumin contains 500 milligrams of turmeric. Therefore, a daily serving contains 1000 milligrams of turmeric. One bottle contains 60 capsules, which provide a 30-day supply. Users are warned against exceeding the recommended dosage. Children under 18 years, nursing mothers, pregnant women, and persons under medication should consult a medical professional for directions. The manufacturer advises consumers to use the six-bottle package to achieve optimal results. The manufacturer of Turmeric Curcumin claims that the product is risk-free, which means that there are no known side effects. Turmeric Curcumin is available in different packages and the prices differ depending on the number of bottles purchased. One bottle (one month supply) costs $48.00. Three bottles (three months supply) cost $33.00 each. Six bottles (six months supply) cost $24 each. One of the captivating facts about Turmeric Curcumin is that the manufacturer offers a satisfaction guarantee that allows unsatisfied customers to return the product within a period of 365 days if the product does not work. This is a very long duration implying that the manufacturer is confident that the product works. Unsatisfied customers can return the product for a full refund of their money with no questions asked. 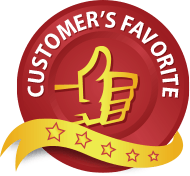 We also found many positive reviews from customers who have used the product. Such reviews indicate that Turmeric Curcumin is an effective product. Turmeric Curcumin is undeniably a top-notch product that users can trust. This review has demonstrated that there are many factors that might encourage potential consumers to try this product. For example, this product has the recommended standardization of the main ingredient, which makes it better than other products. Moreover, the ingredient is natural, which explains why it is risk-free. The ingredient is pure, strong and tested, which makes Turmeric Curcumin a trustworthy product for consumers. Furthermore, this product has no binders, contaminants, fillers, and extra ingredients that might have a negative impact on the performance of the product. Additionally, the one-year guarantee and many positive customer reviews demonstrate that this product can be trusted. The product is also produced in a GMP certified facility. Moreover, the company the produces this product has a positive reputation.